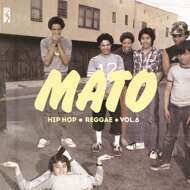 French renowned reggae producer Mato is back with a new killer volume of the “Hip-Hop Reggae Series”. Stix Records rounds up all recent Mato’s 7inches anthems into this extended player, with all the cuts remastered for the occasion. As well as his recent 7inches releases, this collection also includes four unreleased hits: “Gangsta Lovin’” by Eve, “La Saga” by IAM, “Whateva Man” by Redman and “Off The Books” by The Beatnuts. This is definitely one you shouldn’t miss !!!! !